Though more interested in the Celtics this season than in recent years, I somehow missed the radio broadcast of the game against the Rockets the other night. (I also spaced on catching Gorman and Heinsohn on the tube.) So, I am only now learning that Cedric Maxwell said a stupid thing; a stupid thing said for which he will offer an on-air apology during tonight’s broadcast of the Celtics/Knicks (little bottom-feeder) Garden party. I’ve always imagined that Maxwell is a really good guy. Seemingly smart, fun-loving, and appearing not to take himself nor those around him too seriously. And he does a pretty good job as analyst. Great player, too: certainly enjoyed him shutting down Bernard King whatever year that was. My only brush with him was at an airport luggage carousel. (Where else?) I was on a recruiting trip for Harvard hoops; all my bags had Reebok emblazoned on them – they were our sponsors and gave us free stuff. Maxwell, a few years into his retirement, apparently thinking I looked more like a Reebok rep than a college basketball coach, came up to me and asked me if I worked for the sneaker company. I don’t know . . . was he looking for a gym bag? Sneakers? An endorsement deal? Anyway, his ‘mot faux‘ (pardon my French) puts him only as the latest in a long line of those who said (presumably because they were thinking) stupid things. Stupid things that are typically sexist, racist, homophobic; the sort of thing that, undeniably, helps promote and ensure fear, mistrust, division. (“Aw, c’mon, it was just a joke.”) Let’s see: Howard Cosell, Jimmy the Greek, Steve Lyons, and a couple of local Boston radio doofuses: Dennis and Callahan, and many, many others. In the case of Maxwell, it’s easy to imagine, given his carefree, joking, keep-it-loose style, it’s entirely plausible, obvious, in fact, that he was hoping to make a joke, to be funny, to appeal to those who might think it funny. Hmmmm. Maybe not so funny to girls who are listeners or the mothers and fathers of girls and women who continue to seek equal footing, a fair shake in society. I know that sounds sort of heavy, but put yourself in a girl’s shoes, or of a parent of a girl who wants her to have all the opportunities anyone else has. At one point, maybe not so long ago, “go back to the cottonfields” might have been an attempt at humor, too. That one was never funny either. But my problem with all this isn’t so much the speakers, my problem is with what is soon conjured by their superiors (or employers) as the salve to heal the wound, the little band-aid on the boo-boo: this idea of “on-air apology”. That’s all well and good, I suppose, if the goal is to save the job or neck of the misspeaker. But the real problem, the real issue is all those listeners, all those for whom the joke WAS funny (and intended). If there is to be real restitution or retribution, some worthwhile and impactful effort needs to be put forth to demonstrate that the speaker and the group that employs the speaker really means what the apology says. Dennis and Callahan should have been put together with the Center for the Study of Sport and Society or a similar organization to hold “on-air” forums to discuss racism, racist language and its effect on us all. Definitely. It was a great opportunity to turn a negative around. Similarly, Mawell and his employer, Entercom Communications, should team with Women’s Sports Foundation. (or somebody) and face squarely the issue of sexism, sexist language and its damaging effects. If the apology means anything, then that message needs to reach deep inside not only the joker himself, but all those for whom the joke was intended. Besides, Violet Palmer is a really good ref (and I’m crying about calls all the time). Otherwise she would not have been in the league so long. And I believe Cedric Maxwell knows that, too. One of the all-time favorite Never Too Late Basketball drills. 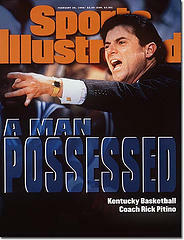 I stole it, I guess that’s what I did, or appropriated it, from Rick Pitino when he was at Providence College. Tom Thibodeau (then a Harvard assistant with me and now with Jeff VanGundy and the Houston Rockets and Yao Ming’s personal post-play coach) and I used to high-tail it out of Cambridge after our practices or on days off and on down to Providence where Pitino used to let us sit in on his practices. We must have observed over a dozen of them in 1987, the year Pitino took them to the Final Four. Pitino is a great coach. He has his foibles and maybe, I don’t know, maybe, he’s not as committed as he once was, but there were years when Pitino got more out his players than any college coach in history. 1987 was one of those years. You pay attention to a guy like that. The player lines up on the baseline with the ball. On the whistle, the player takes off dribbling for a full-court layup at the other end, grabs the ball quickly out of the net and comes back, fast as possible for another layup, grabs the ball again, transitioning quick as can be, and sprints out to the other end, and so on. Total of six layups. Rest by shooting five free throws (two, step-off, then three). Repeat the drill for a total of three “Jacek Dudas”. The coaching staff at PC then, included (incredibly): Gordie Chiesa, Stu Jackson, Jeff Van Gundy, and Sean Kearney. They would, dutifully, chart each player’s times with the goal of getting faster, fitter, competing with greater resolve. Pitino set goals for guards (28-30 secs), forwards (30 secs), big men (32-34 secs). And we’re talking an NBA/NCAA full 94 foot court! Get out there with a friend and a stop-watch and try it. And then try it again next week and the week after. Let’s go, you gotta be faster than Jacek! “After nine hours of basketball, the air-conditioning system seemed to have a nervous breakdown. Still, more than 500 fans shoehorned into the tiny, sheet-metal gym at Pleasant Hill High School on Saturday night. When the bleachers filled, some people grabbed folding chairs. Others sat on the floor along the baseline. Flashes of yellow rippled through the crowd as spectators fanned themselves with a booklet of team rosters. All seven high schools in Sabine Parish have won boys state titles; five of the girls teams have won. They had squeezed inside to see the Zwolle Hawks, the county power that is either 43-0 or 44-1 this season, depending on the inclusion of two informal games. Some fans had arrived in the morning, sitting through six previous games of the Sabine Shootout, a tune-up for the Louisiana state playoffs that begin Feb. 23. There are thousands of one-blink communities like Zwolle (pronounced ZWAH-lee) around the country. Some, in states like Indiana and Kentucky, have become mythic for their hoops-on-a-barn devotion. But perhaps nowhere does basketball zealotry surpass the rural fervor of the timber and railroad towns of Sabine Parish. All seven parish high schools have won a state championship in boys basketball; five of the girls teams have. The nation’s greatest schoolboy scorer and its leading career rebounder played in this poor, racially diverse county on the Texas border in north-central Louisiana. So did the highest-scoring boys and girls teams, according to the National Federation of State High School Associations. Limited men’s college basketball report: Saturday, February 24, 2007. Spending the week and weekend in Tiverton, RI. Nice place on the water, throwing the frisbee for the dog, jump starting the rusted-out ’89 Chevy pick-up, using a bicycle pump to inflate the long flattened tires, hanging around, in-and-out, watching games. Creighton/Wichita State, Iowa State/Kansas, BC/Clemson: they’re all on. Settle into the Syracuse/PC match-up while keeping an eye on the Eagles, making sure they get the win and both feet in the Selection Committee’s door. ‘Cuse/Friars grabs my interest because they’re both on the bubble, tussling for their 2006-07 basketball lives. Plus PC coach, Tim Welsh, was an assistant at Syracuse and one of Welsh’s assistants is a former point guard for The Orangemen. (Picked all this up and more in the perfect-Sunday-morning-read college game reports in The Sunday ProJo. They had writers everywhere: The Dunk [10,000 in attendance], URI [6,000+], Brown [1,100+], even at RIC in the Little East title game. Awesome babe-e-e-e-!) Big threes by both squads, missed layup, blown call by an official, ‘Cuse by 4. Friars in need of absolution. Take me west, Little Rhody, over to Kingston, where the Fordham Rams (“super team, show ’em that you’re not just a wild dream”, sung to “Jesus Christ Superstar”) go box-and-one on URI coach Jim Baron’s son, Jimmy Baron, the leading three-point shooter in the country, hold him to ZERO field goals, and come out with a 71-62 win to deny URI Rams a shot at Atlantic 10 title. Decide late afternoon to take-in live and in-person the Brown Bears/Cornell Big Red contest at The Pizzitola Sports Center at Brown. Park right outside the door, pay ten bucks (twenty with wife/date), fourth row seat directly across from the Brown bench, the better to study the coaching calls/demeanor/style of first year Brown headman, Craig Robinson. First thing you notice is Robinson is wearing a very expensive suit, but no tie. Cornell’s coach, Steve Donahue, a Philly guy through and through, is wearing a tie, but no jacket and what appear from the distance to be Docker khakis. Robinson is tall, Donahue is not. Robinson rarely stands during the game, Donahue never sits. Both coaches aim to get to the top of the Ivy League. The passion and energy with which their teams play this particular game makes it clear they each have a good chance of doing exactly that. They come to the game at different stages: Robinson, in his first year, has let it be known that he expects to succeed and soon. From where does the confidence come? Check out the man’s life resume. And what makes Docker Donahue think an Ancient Eight title can be had in the Gorges of Ithaca? Well, he’s led The Big Red to its third consecutive plus .500 Ivy League season, sat at the right hand of Fran Dunphy at Penn for years and has players who have won 11 of the 12 Ivy Rookie of the Week honors thus far this year. They’ve got it goin’. With the Princeton program in a fog and Penn perhaps vulnerable because they’re graduating their best and are led by a non-Philly head coach, Glen Miller (not to underestimate Glenn Miller but you look for chinks in the armour wherever you can), which may make recruiting less robust than the norm, there’s a chance here for someone to move in. Both teams played extremely hard. (Mark McAndrew, Brown and the Ivies leading scorer, hustles, drives and dives, shoots his way to a career high 33 points then hops off the court on one leg, all cramping and spasming, with a minute left). Both teams wrought turnovers when they extended pressure. Cornell was in control, really, the whole game. Brown has zero post presence, zero, which severely limits them in the Princeton-style offense. (No post, not one backdoor cut and catch, some hesitant outside shooters . . . how does Brown stay in, and win some, games?) Cornell relied on, and won the game with, their freshmen shooters, Whitman (if there were a NCAA Freshmen Three Point Shooting Contest at year’s end, he would be a lock nominee) and Dale, who combined on 9 for 16 shooting from behind the arc. Whoosh! from the corner. Whoosh! from the wing. Again and again. Threes add up quickly. (How were they getting so open?) Ball game. It will be interesting to watch these two programs in the coming years. I’m rooting for them both. “DJ ta Buhrrrd!”. DJ to Bird is part of what you still hear today if you were one of the lucky ones. One of those who sat and stood and leaped to your feet and pumped your fist and watched and lived and died with those teams from the mid-80s. And only if you can still hear Johnny Most’s voice, like it was just last night, the voice that always spoke the words that were the truth. For the past fifteen years, at every NTL Weekend Camp and at every NTL Weekly Clinic, we have taught going backdoor from the block when your defender jumps out early on the downscreen, hoping to beat you to the spot where you’ll drop your deadly jumper. Just last Thursday, at Matignon HS in No. Camridge, MA, for instance, we drilled that. We instruct that the point guard zip a “one-handed off the dribble pass” to the cutter who, face-guarded, fakes a run to the corner and, cutting back, finds himself open under the hoop. And, after that fastball of a one-handed pass, we always say, “DJ to Bird”. Because that’s what it is: DJ to Bird. DJ came to the Celts in a trade for Bird’s best friend on the team, Rick Robey. The paper’s are saying today that he was brought in to stop Magic Johnson, but I remember it being to stop Andrew Toney; there was no getting to the Lakers without getting by the Sixers. His previous coach with Seattle, Lenny Wilkens, dubbed him “a cancer”. (How did he really feel?) The Celtics trusted him, knew his hungry heart; Johnny Most spoke no ill of him or of any other Celtic. Ever. I remember Bob Ryan once writing in The Boston Globe (in the definitive DJ piece) that DJ won the 1979 championship by dominating the finals’ series defensively FROM THE BACKCOURT! That was unheard of and spoke to the strength and uniqueness of his abilities. Yeah, maybe he couldn’t win any shooting contests, but he was the one guy who could, when Bird was wearing Cooper and Mychal Thompson was smothering McHale, he was the one guy who could grind it out to the hoop and get the toughest bucket. DJ was toughness and competitiveness and an absolute true hero to the true believer Celtic fans. Everyone needs someone you can count on, right? ; we could count on DJ. I can’t tell whether I feel like that was just yesterday or, now with DJ’s passing, impossibly long ago. “Now there’s a steal by Bird, underneath to DJ and he lays it in”! You are big or at least bigger than the person guarding you. Mismatch! One of your teammates, the one that likes to tell everyone what to do, starts barking, “Post up, Post up”. You think, okay, I haven’t touched the ball in the last fifteen possessions, can’t hurt to try. So, you run down to the block and look and look and look for the ball to be passed in. No ball. Nothing. What’s up with that? Your teammate, who it turns out came off the bench for a team that went to the Sweet Sixteen in the mid-80s, is not impressed with your “post up”; obviously just being “in the post” does not qualify. During the next break in action, here’s what your teammate will tell you to do: make contact with your back against your defender. Lean right into him/her so that you can manipulate and react to any movement the defender may make. Almost like boxing out for a rebound. So, you run down to the post, to an area above the block, around the first marker. Still running forward, you run INTO the defense (arms across your chest). You then turn while continuing to push into the defender, but this time with your back and backside. (The bigger the backside, the better the post up!) You bend at the ankles, knees, hips and waist, anywhere you can bend, bend. This provides stability and strength so when the defender pushes back, you won’t give up the position you’ve established. Next, turned, you make eye contact with your Sweet Sixteen coach-on-the-floor and you get your “arm bars” up: elbows out to the side at shoulder height, hands up at ninety degrees. You spread out making yourself big. Bigger and bigger yet. And you start yelling “BALL, BALL!! !” Now, everyone in the gym knows you are really POSTING UP! Thanks to Akira Motomura for the tip! One way to improve your basketball skills, and in this case, your basketball shooting skills, is to watch what the great players do and how they do it. The NBA All-Star weekend and game have nothing to do with basketball, far as I can tell, save the piling-on promotional aspect, except, EXCEPT the Three-Point Shooting Contest. There the players have to shoot the ball (under pressure, time pressure) like you have to shoot the ball in a game. Well, in a game, I guess you don’t have a rack right next to you and you do have a little more time after each shot to do something like follow-through, but the participants still have to employ good fundamentals to have success. Those fundamentals are what you as a player who wants to improve your shot should look for. After grabbing the ball off the rack, does the player do anything to achieve good balance? Balance being critical; you can’t be leaning left, you can’t be leaning right. Is there a small one-two step? A tiny hop to adjust feet? How do they get the ball to their “shot pocket”? That spot that aligns elbow under hand, hand under ball? Do some players have the left (or off) elbow up higher than others? Do all the players have elbow-in, or are some getting away with it out? Is the head still on release? Where is the release point? In front of the middle of the head? Out to the side more? (Two-eyed shooter?) How about the extension of the shooting arm? Does it go straight out to 180 degrees? Just less? What about the follow-through? Is it consistent among all the shooters? What is the off-hand doing, and the off-arm? Does that off-hand flick out? (Bird, Kerr, Szczerbiak.) Or does it stay stone still, left hand fingers pointing straight up after the release? Shooters can shoot the ball different ways and have success. The key is to find the common elements among all great shooters and try to incorporate those elements into who you are as a shooter and into what your shot is already like. Now, I gotta go buy one of those racks, actually five of them, right? Five red, white and blue balls, too. (The other twenty are in the back of the station wagon). Get ready for next year.